Anti-bullfighting protestors with black- and red-painted bodies formed an image of a wounded bull on the plaza of the Guggenheim Bilbao, the other day. A few weeks ago Catalonia banned bullfighting beginning in 2012, and sensing blood, the activists are seeking total abolition of the traditional sport. Of course, they object to the mistreatment of the animals, but take a look at this image (below) from the ring in Navarre, Spain, last week. (The sensational photo was published by Diario de Navarra, which has some amateur video, as well.) 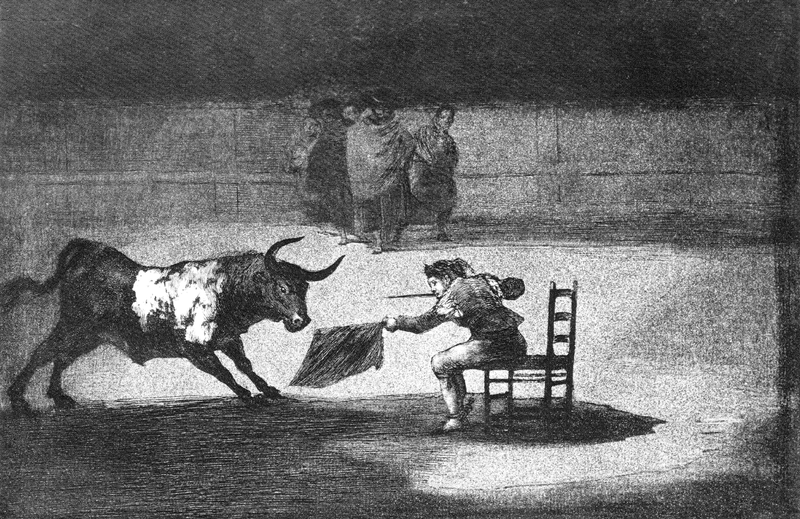 Goya depicted a similar incident in his 1815-16 etching series “La Tauromaquia,” or “The Art of Bullfighting.” He knew that the ancient sport can be dangerous not only to toreros. In the recent episode six people wound up in the hospital, though none was injured gravely. After 15 minutes a group of spectators subdued the bull until it could be roped and put to death. If you’ve attended a bullfight – they take place in Iberia, Southern France, Mexico and South America – you know that it combines rodeo with a dance of death, usually the animal’s. The event consists of a series of matches — like innings in baseball — in which a bull is let into the ring, then systematically debilitated by lancers on padded horses who repeatedly pierce the upper back, then by men on foot who race past the wounded animal and with both hands thrust barbed and beribboned daggers into the shoulders, and finally by the matador who taunts the bleeding beast into charging a red cape, then faces off with the animal and finally plunges a sword into the flesh behind the head. A bull that puts up a gallant fight can be spared by the crowd, and a bullfighter who exhibits extraordinary machismo or elegance can be awarded the beast’s ears. The sport is a cultural artifact steeped in ritual and national tradition. Indeed, it is considered an art. Newspapers cover the events in a combination of sports writing and ballet criticism. (Hemingway famously tried his hand at the genre.) The focus is on the bullfighter whose excellence is a matter of demeanor — how closely he allows the animal to pass, the elegance of his movements and their harmony with the bull’s, his non-chalance in turning and walking away from the animal. Style and swagger are everything, and the bulls themselves are critiqued along with their executioners. Yet, it was also disappointing. Many of the fights were dull. The odds are stacked against the animal not only by the number of his assailants and their superior armor, but also because in today’s matches his main weapon, his horns, are clipped down to stubs. There are farms that specialize in breeding fierce bulls, but few that I saw were admirably game fighters. Neither were all the toreros admirably daring and elegant performers. Like boxers, most were roughnecks drawn from the lower economic ranks of society who seemed less brave artists than kids struggling to earn a living. None exhibited the sort of grace and gravity that could elevate the encounter from slaughter to the sort of mythical grandeur to which it aspires. Rather than a pathetic and awesome enactment of the conquest of good over evil the event seemed more a demonstration of human injustice. Should the ancient sport be abolished? Patrice, you are a riot! I bet a naked matador could do his thing – provided he had a very sharp sword. In Portugal they don’t kill the bull, but grab him by the horns. And remember the famous frescos from Knossos of those lunatics vaulting over charging bulls? Now that took cojones! P.S., I’m not showing up for the exploding Taliban event. I meant for the matador not to have a sword… Listen, I don’ even like circus acts, Portuguese bullfights.. I am hopelessly on the side of the animals. The event and its pomp celebrates our berth atop the food chain, and I would find suspect marking this position with naked matadors grabbing bovines by the horn. Nevertheless, the sport would benefit from modernizing the tradition with a battle that does not include the pike, the dagger and the sword, but includes other displays of courage and artistry. I like the image of gymnasts vaulting over a snorting bull rather than a stuffed leather “horse.” Oliver, have you ever seen cowboy poker? Four fearless bronco busters sit around a card table in the middle of the ring…then they let in a nasty bull. Last one seated wins. It’s pretty scary – the bull looks around and realizes there are four guys just waiting to get rammed. He generally heads right for them. Not much artistry, but not for sissies! By the way, Anthony and Patrice, apparently the French have matches in which unarmed daredevils try to pluck a rosette from between the horns of the bull, or members of a team dodge and leap over the beasts. These more humane variations take place in the south of France. I have to go see one, though the thrills they offer are different from those of the traditional taurus totentanz! It’s very hard for one to decide if a traditional part of Iberian culture which has been handed down to the Spanish colonies should be abolished. It is a cruel act indeed but when one is born and raised around it one does not question it. The question only has come with the progressive animal rights wave of civilized evolution?! Truly, it’s part of one’s life, celebration, understanding…and I must say hanging out having “jerez” (dry sherry), dancing and laughing with friends and “toreros” in haciendas during the season is pretty fun! It is a ritual and it would be interesting to see how bullfighter’s prepare before dressing up in “traje de luces”. Spain, maybe stereotyped, but is passion, machismo, blood, Picasso, Garcia Lorca and bullfighting is part of it as is flamenco, sevillanas, tapas, wine and good food! I love animals too but it would be very weird to see this sport/art be extinct.